Bjoern Hartmann, Director of the new Jacobs Institute for Design Innovation at UC Berkeley, was one of the panelists in the Expert Briefing on the Maker Movement. SACRAMENTO, Calif. – The California Community Colleges (CCC) are another one of CCST’s State Sustaining Institutions, and it was fitting that the featured CCST Expert Briefing during S&T Week focused on efforts by the CCC Chancellor’s Office to adapt makerspaces and the Maker Movement for higher education in California. 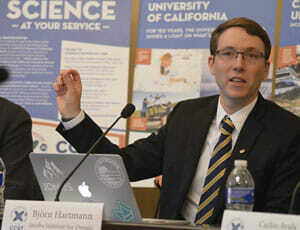 The third in CCST’s recently-introduced series of “Expert Briefings“, the February 21st offering on Makerspaces and Higher Education in California brought together experts from the University of California, California State University, and the California Community Colleges to discuss current efforts in each. The briefing was cohosted by the California Community Colleges Chancellor’s Office (CCCCO) in the State Capitol, with support from the Assembly Committee on Higher Education. Drs. Carlos Ayala and Jeremy Qualls came from Sonoma State University (SSU) to brief Capitol staff on CSU efforts to bring making to all students. Dr. Ayala, Dean of the School of Education at SSU, spoke about the Maker Certificate Program offered by SSU, the first program of its kind designed to certify K-12 teachers to effectively incorporate the ethos of making into their teaching practices. In order to expand the offering of this certificate, the CSUs are also planning to outfit makerspaces on all CSU campuses, with libraries as the target site for new makerspaces. Dr. Qualls, Professor of Physics and Astronomy and Director of Academic Planning and Resources, followed with a discussion of the new SSU makerspace and a new course he is offering to science undergraduates. He spoke about how empowering making experiences can be for students who have little real-world experience with tools and certain technologies before college. Carol Pepper-Kittredge, Statewide Project Director for the CCC Maker Initiative, spoke about the CCC’s efforts to “bring innovation to scale” as the colleges build a network of campus-based makerspaces all throughout California. She explained how, as 24 colleges are building and enhancing their makerspaces, they are also building their community of practice, developing curriculum, and designing internships through the spaces. She reported that nearly 5,000 students have been through the makerspaces, while over 200 employers and nearly 300 faculty had been engaged to participate. Pepper-Kittredge highlighted the importance of developing maker culture throughout the process. The discussion after the panel lasted until the last minute of room availability, with questions ranging from the design process to how skills could be transferable between prototyping phases and actual manufacturing. Several staff and guests in attendance at the briefing also returned later that evening to join the CCST reception, and continue discussions with the panelists. In all, the event served as a reminder of the inestimable role that community colleges have always played in the training and education of our state’s innovation workforce – and CCST’s small but impactful role in advising our California Community Colleges partners.